Hieu sat at a table, near Rise by FareStart, in her Foodservice Apprenticeship uniform. She was eager to talk and launched into her reasons she was so excited about the program. Hieu graduated from the program two days after talking with us and she was excited about her next steps. The Foodservice Apprenticeship Program is a 10-24 week on-the-job paid training program that is geared towards people who have had historical barriers to employment advancement and some previous experience in the foodservice industry. 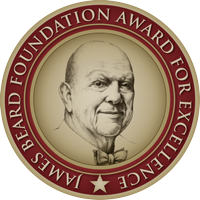 The program is endorsed by the Washington Hospitality Association. The program gives people the chance to skill up in a variety of culinary tracks such as: line cook, server, corporate dining cook, catering cook, coffee shop lead and catering captain. Graduates of the program have seen an average of a 20% increase in their wages because of the training. Hieu knew that she needed to skill up. She worked in restaurants and cafeterias before, but most of her career she had been a caregiver. She was working in retirement homes and other organizations for nearly ten years, but then she had to stop so that she could care for her mother. 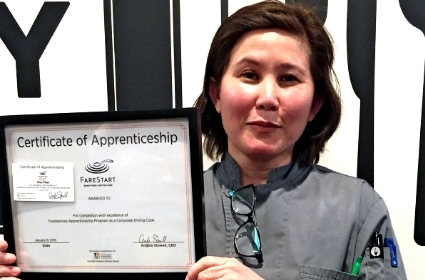 She has some advice for anyone thinking about starting the Foodservice Apprenticeship Program.